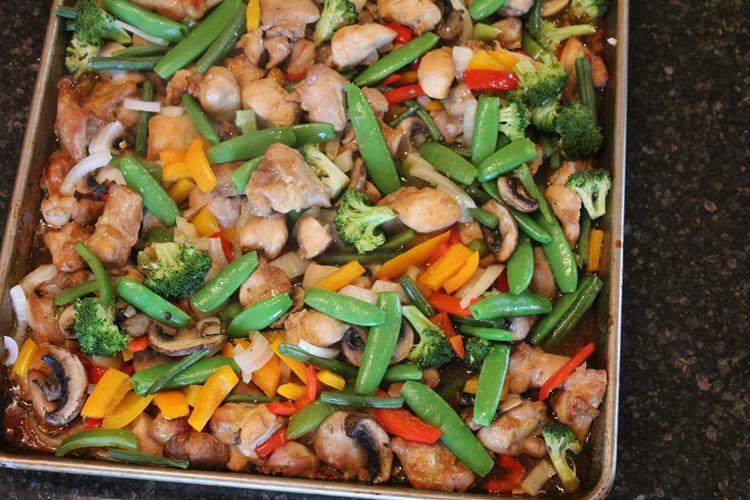 Sheet Pan Chicken Stir Fry is a quick and easy way to make stir fry! In general stir fry is not hard to make. It is actually quite easy, but it does take a little bit of time standing by your stove stirring things in the wok or pan. It is kind of hard to walk away from a stir fry that is cooking. 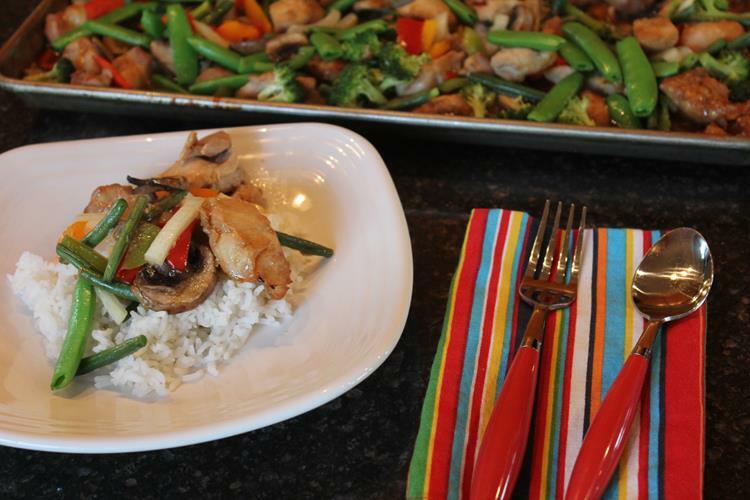 That is why I love this sheet pan chicken stir fry. If you want a true Asian stir fry than this recipe is probably not for you. But if you are trying to get quick and easy healthy meals on the table for your family than this recipe is perfect! We love this way of cooking stir fry. My husband requested that we eat it more often because he enjoyed it so much. And the leftovers were great in his lunch the next day. One of the things I love about this is that you can vary the vegetables with what you have on hand or what is on sale. Just about anything will work in this. So use what you like or what you have on hand. I have only tried this with chicken, but I am going to try it with pork and beef soon. The meat has more flavor if you marinade it all day, but you don’t have to. 6 – 7 cups cut up or sliced vegetables, onions, peppers, broccoli, carrots, green beans, mushrooms, etc. If using snow peas or a vegetable that only needs a few minutes cook time keep it separate so that you can add it at the very end of cooking. Place oil, soy sauce, cornstarch brown sugar, honey, rice vinegar, hot sauce, ginger, and garlic in a large zip top type bag. Mix together well. Add chicken to marinade mixture and mix to coat well. Place bag on a plate or bowl and refrigerate for 2-8 hours. It is best to make it up in the morning and let it marinate all day, but you can do it for just a couple hours as well. Or if you don’t have time you can skip the marinade and just cook the chicken in the sauce. It will have more flavor if you marinade it though. Pour chicken and marinade onto a large sheet pan or two smaller baking pans. Remove from oven and stir in vegetables. Cook for 10-15 minutes more or until vegetables are tender and chicken is done. Add in snow peas and any other vegetables that only need a few minutes at the end of cooking time. Sounds like my type of food and my type of cooking! I will be trying this recipe! That looks so good. I hadn’t thought of cooking it that way, but it would be a lot easier for me than cooking it on the stovetop. 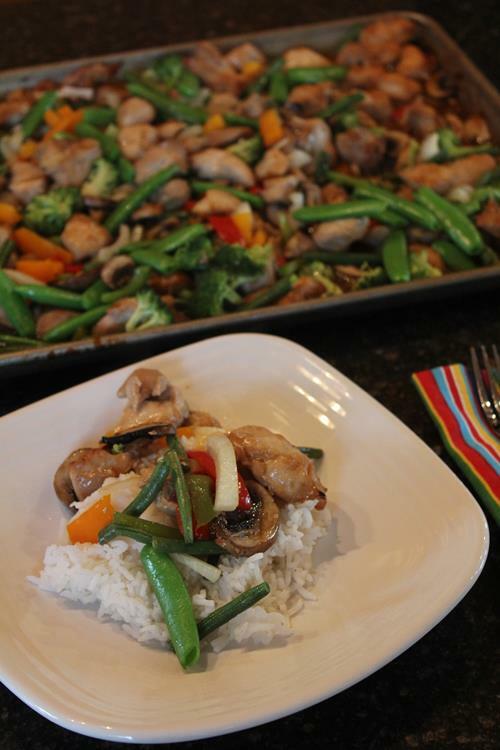 It makes it really easy especially when you are cooking for a family and need a lot of stir fry. What if you use frozen vegetables? Do you know if that would vary cooking times? Thanks!